The policy group called ALEC (the American Legislative Exchange Council) had its 40th anniversary meeting in Chicago on August 7, 8, and 9, but not everyone was celebrating. In front of the hotel at which the event was held, the unions gathered to attack and one Chicago school teacher took the occasion not only to say that capitalism has failed and that government should be for the redistribution of wealth, he also threatened “violent revolution” unless America acquiesces to union demands. 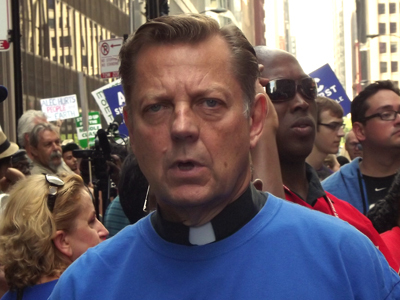 CPS Teacher Timothy Meegan, who teachers at Roosevelt High School in Chicago, had quite a bit of boilerplate to say about ALEC, but before long he edged toward some more startling rhetoric, the sort that makes one hope he isn’t teaching to Chicago’s school children. And all this talk of violent revolution was Jesse Jackson approved. The very right reverend can be seen clapping Mr. Meegan on the back after his diatribe is over. 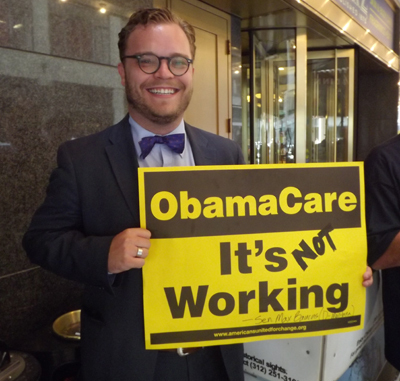 In another video from the event, blogger Duane Lester found a protester who was sure that ALEC was trying to create legislation that would make it legal to murder minorities. 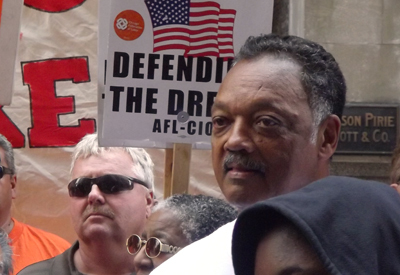 Of course, Jesse Jackson was on the scene and so was Chicago’s radical Catholic priest Father Michael Pflager.